Hello everyone, today I’m doing a Hugo Boss 1512567 watch review. Hugo boss make some of my favourite designer watches, I just love the big bold style that a lot of them feature. 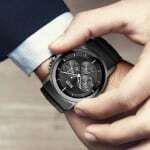 The Hugo Boss range tend to focus on stylish time pieces and the overall look of the watch rather than going for any specific special features. 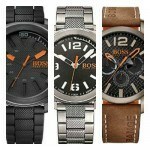 You may also be interested in my Best 21 men’s Hugo Boss watches. Anyway I’ll get on with my Hugo Boss 1512567 review below, you can click here for the latest reviews, ratings and PRICES on Amazon, enjoy. 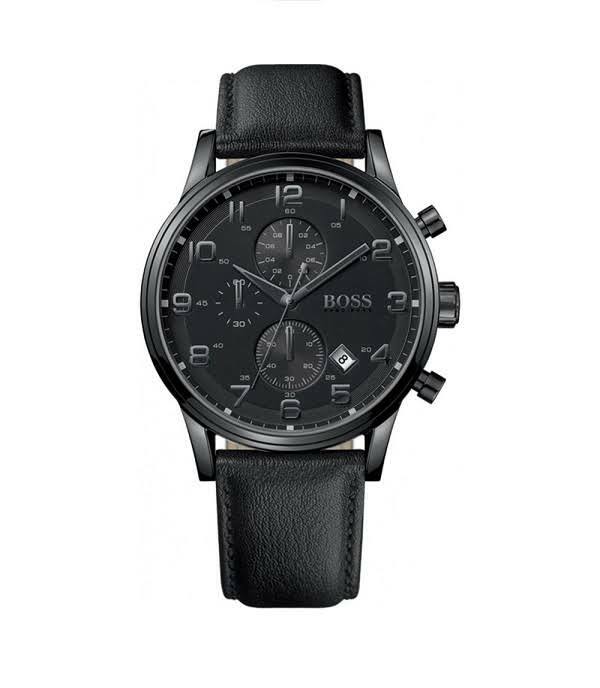 This is a very popular watch by Hugo Boss that just oozes class, the all black watch design is in high demand at the moment. It has this very smart feel to it and would work nicely with either a casual or processional look. The movement is a fairly standard quartz so nothing special going on here but that’s similar for a lot of the designer watches you see around. I personally prefer watches with leather straps so it’s nice to see they’ve gone for a comfortable genuine leather strap. I find them a lot nicer on the skin than the stainless steel bracelets. Before we get onto the main details on the watch we can’t look over this major detail, it’s going to be hard to read at night. This is of course a big flaw of any all black design watch and it’s that trade off you have to make when you want this sort of style. It’s not like it will course too much trouble as a lot of people will jsut end up looking at their phone anyway. The Hugo Boss 1512567 uses a specially hardened mineral glass. This type of glass is what you would expect to see in a watch in this price range, it offers a good level of resistance to scratches and bumps. Appealing to the mass market this watch is a pretty popular size with a casing diameter of 44mm which is classed as a large case. the thickness of the case is 11.5mm that again is considered large. Overall it gives the watch that nice large but not too huge feel to it, the happy middle zone. This watch features a standard date display at an offset position at the 4.30 marker. I think it would have looked better without this addition myself rather than struggling to fit it onto the dial. 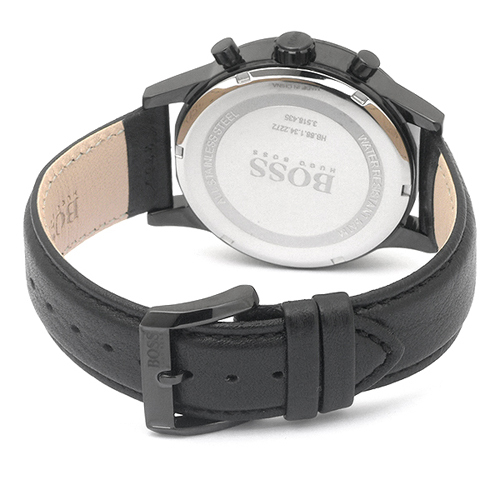 The Hugo Boss 1512567 uses a soft genuine leather strap that’s very comfortable on the wrist. It’s embossed with the Boss branding on the inside. They’ve gone for a standard buckle clasp which is black to go with the rest of the watch style. The strap itself is 20mm wide which is a standard size and perfect to go with the rest of the watch. Thanks for taking the time to read my Hugo Boss 1512567 review. As with any designer watch you have to accept you are paying somewhat towards the brand name. It’s true you could get a watch with better quality parts like the Seiko SNXS77 but some would say it doesn’t look as nice. I for one love my designer watches and just accept that paying for the brand is something I’ prepared to do, like so many others are. When you take into consideration the watch design, features and pricing I hope you can see how I came to my rating of 8.5/10. For me personally I’d definitely consider buying it. 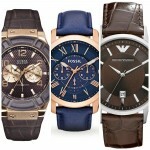 If you’re looking for something a little different make sure you check out my best 21 men’s watches under £200 sometime. Hope you found this Hugo Boss 1512567 review useful and enjoyable, comment below and let me know what you think of it. Click here for the latest reviews, ratings and PRICES on Amazon.